1894 June 1st Friday June 1st 1894 I was busy about the house all the forenoon I began to put screens in the windows as it has turned warmer and the flies are coming. Will planted the late sweet corn and put up some screen doors in the afternoon. He lost a hog today the pigs died too It is seven years today since Ott & Fanny were married. Saturday June 2nd 1894 I finished fixing the windows this morning and did my Saturday baking. We went to town in the afternoon and I was over the river. I did my evening work after coming home. Weather warm. Sunday June 3rd 1894 I was all the forenoon doing up the work and getting dinner. Uncle George and Aunt Lib were here for dinner. Father & Mother came out in the afternoon and stayed till after supper. a very enjoyable day. 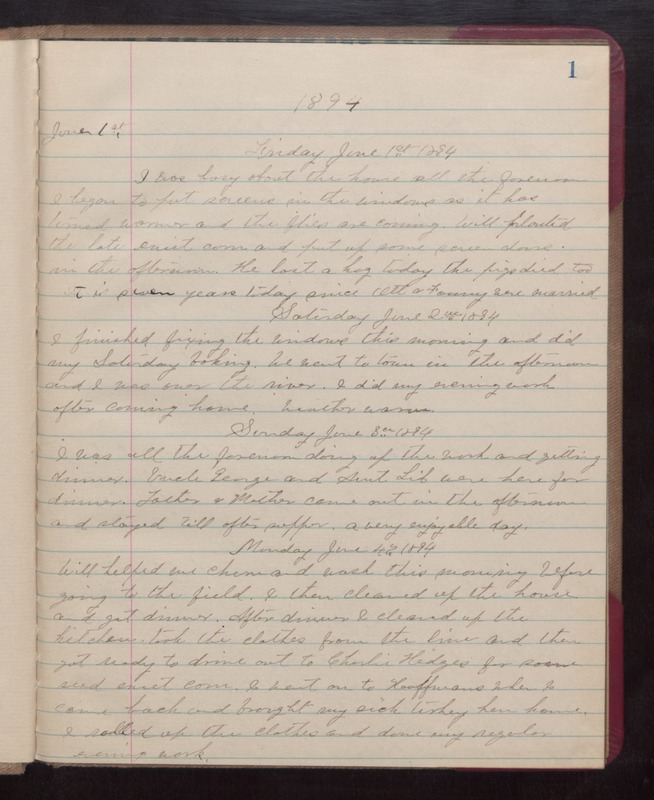 Monday June 4th 1894 Will helped me churn and wash this morning before going to the field. I then cleaned up the house and got dinner. After dinner I cleaned up the kitchen took the clothes from the line and then got ready to drive out to Charlie Hodges for some seed sweet corn. I went on to Kauffmans when I came back and brought my sick turkey hen home. I rolled up the clothes and done my regular evening work.